Seven-star mantis quan is a kind of shape-simulating boxing, which was developed and compiled by Wang Lang, a boxer at early Qing Dynasty, applying the capturing and fighting skills of the two arms when he researched the scene of mantis capturing cicada. 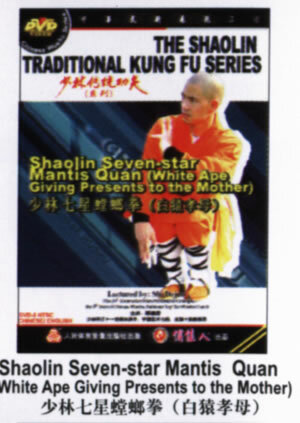 Later, Wang Lang stayed at Shaolin Temple for 3 years, and taught mantis boxing to the monks. White Ape Giving Presents to Mother is one of the routines in seven-star mantis boxing, which uses the temper force with grace, both long and short actions, harmonious and consistent actions of the hands and feet, forthright rhythm, integral strength and complete force, the actions of hook, grad, twining and closing, being coherent, compact and most changeful.